In admiration of my loving priest, Father Kyle Walterscheid, who always leads me to the Cross on Mount Calvary, I write this blog post. Note: To all who read my previous post about ad orientem and were offended by my blunt commentary, I deleted the post so as to write a more educated post that will hopefully be more usual than just my banter. If I offended anyone, my deepest apologies. Mea cupla. Pax Christi. 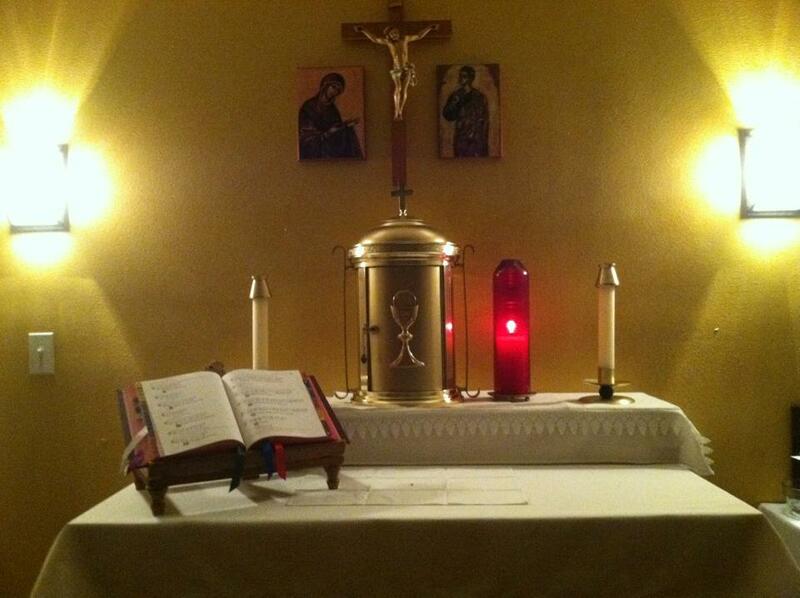 Pictured here is the altar, ready for Mass, at Blessed John Paul II University Parish in Denton, Texas. Blessed John Paul II is the Catholic Campus center for the University of North Texas and Texas Women's University. Blessed John Paul II University Parish offers all daily masses, Holy Days of Obligation, and the Sunday High Mass ad orientem. Note: There are hundreds of traditional liturgical blogs on the internet that talk about the importance of ad orientem. His Holiness, Benedict XVI, has written countless of literature on the Sacred Liturgy! If you're not willing to do your own research, be content with living in your own darkness and do not complain if someone wants to do things more "traditionally". If you wanted the rights to complain, you should have done your own research and found whatever it was in error and fault. That is when you can clearly be against something! Might I suggest Joseph Cardinal Ratzinger (Benedict XVI)'s book entitled "Spirit of the Liturgy" or any books about the Reform of the Reform (in reference to liturgy). The New Liturgical Movement blog is also a fantastic resource! Ad orientem...a phrase that literally means "towards the orient". What does the orient mean? It means towards the east. In the tradition of the Church, from the times of the early Christians celebrating on top of the tombs of apostles in the catacombs to about the time of the 1960's, for most of the Catholic world, the orientation was "towards the East and the rising sun" which is Christ the Lord. As we pray, we pray towards the East, so as to better bring about what the Psalter describes as the direction of prayer into the conformity of our own Catholic doctrine. Now, what does this have to do with anything? What does this have anything to do with us in these modern times? Why should we have a particular orientation of prayer? Can we not pray however we wish to? Well, if we were to talking on an ecumenism level, then I would have no real argument, for if people do not believe in Christ being transubstansiated Body, Blood, Soul and Divinity in the Most Blessed Sacrament, then facing a gold box against a wall while praying would almost seem pointless. Even if the Blessed Sacrament wasn't reserved, without the proper understanding of to whom to towards what you are orientating your prayers to, ad orientem looks pretty silly. Now, it's time to explain from a Catholic perspective. When you enter into a church, do you realize that at that moment, when in front of the Blessed Sacrament, you are in the real and true presence of Christ and are at Mount Calvary with Him as He perfectly was when He died on the cross for our sins? If you were to put on the "eyes of Heaven" you would see countless flocks of angels around every single tabernacle around the world, prostrated before Our Blessed Lord in the Most Holy Eucharist - especially during Holy Mass. At the same time, you would physically be transported to the very time and place on Mount Calvary when Our Blessed Lord offered up Himself unto Almighty God for the sins of the whole world. You would see Our Blessed Mother in silent tears; she too offering up her own Son without protest. You would see the Beloved Disciple, St. John, looking up at Our Blessed Lord while comforting the Blessed Mother. You were hear absolutely nothing, for all of the Gospel accounts, all were silent before Christ as he lifted up His soul to Almighty God. It wasn't until after that that the earth began to shake, etc., etc. Now, why do you ask, are we transported to Mount Calvary. We are transported because it is by that very act, the very nature of the act, the very essence of Christ's "once for all sacrifice" was and is and how we receive Him so dearly. 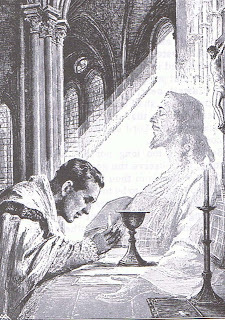 When we approach the altar rail and humbly kneel before Our Blessed Lord in the Most Holy Eucharist, we are actively kneeling before Almighty God as he offered Himself up to Himself. We are then given His own flesh and blood to consume, the very essence by which eternal life streams from (John 6). We are all, including the priest, onlookers to that wonderful, beautiful, and bloody sacrifice on Mount Calvary. We are all dependent on the necessary grace of Almighty God. Who are we that we are to gaze towards anyone else during this most sacred occasion. We take on the roles of the people who were at Mount Calvary by gazing towards the cross of which Christ Himself was crucified on. 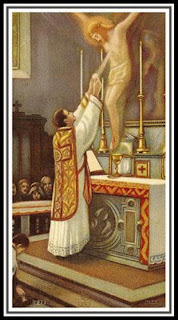 Is the Holy Mass some kind of communal effort that we give each other a "pat on the back" for doing a job well done? The answer is no. We must then orientate ourselves to the Cross, to the Tabernacle, by which Our Blessed Lord dwells among us in His most perfect state of Priest and Sacrifice; in Glory in Heaven and on earth offering Himself upon the cross for our very redemption on Mount Calvary. It baffles my mind when people, who not by their own fault, are so ill-catechized that they truly believe that Jesus Christ, Our Lord and Savior, King of the Universe, in the Tabernacle is a distraction during Holy Mass. If Christ is a distraction to you, you should probably go see a priest and have that fixed. When you pray in a chapel, you are hopefully praying towards the sanctuary where the Most Blessed Sacrament is kept in a tabernacle, for that is where Almighty God is truly present in the fully reality of the Second Part of the Blessed Trinity. If you do have an issue with this concept, I suggest that you speak with a Catholic priest on the Church's teachings of transubstansitation. The tabernacle is hopefully in horizontal center of the sanctuary, thus becoming the pinnacle of which prayer is orientated towards. If it is not, you should talk to your priest about his true beliefs of Christ in the Most Blessed Sacrament. Before I continue, why is it important that Christ, who is Almighty God, King of the Universe, Lord of All Creation, be the primary focal point and center of any sanctuary. If you are a Catholic and you are asking this question, I suggest that you do some serious prayer on your own faith. 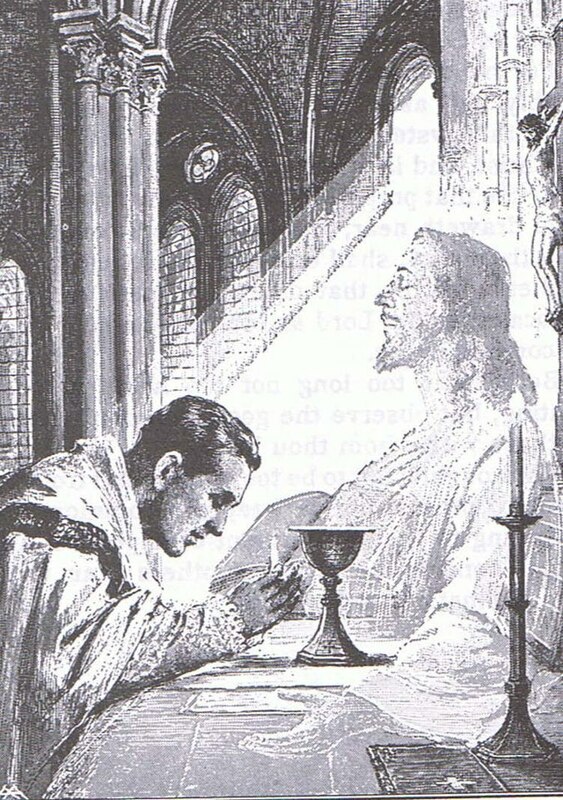 If you do not wish Almighty God to be the primary focal point and in the center of the sanctuary that Holy Mass is being offered, you do not fully believe and fully trust that Jesus Christ, the Second Part of the Most Blessed Trinity, is truly present, Body, Blood, Soul and Divinity, in the Most Blessed Sacrament of the Altar. You might say you do. You might even preach that you do. However, if you are not willing to have Him in your sanctuary as the prime focal point for all liturgical actions and for the Holy Sacrifice of the Mass, to whom we offer up to Almighty God Himself as we gaze upon Mount Calvary, your words are meaningless. You do not fully trust in God if you do not make Him the absolute focal point of all prayer within Christ's Church. Now, when I say, "make Him the absolute focal point of all prayer within Christ's Church," some might say, "But Chase, we're always praying to God. We don't need God present in the Tabernacle before us to pray to Him. God is everywhere and in all of us." "Oh ye of little faith. You say that you believe in God. You say that you believe in what Christ's Church teaches. You say you fully believe in the reality of Christ being present Body, Blood, Soul and Divinity in the Most Holy Sacrament of the Altar. If you're not willing to have the Tabernacle where God is currently dwelling as the primary focal point of prayer, fixated on the altar so as to perfectly depict that sacred sacrificial act of Mount Calvary, and orientate yourself so that all may know that you are praying in the same direction towards Almighty God whom you trust (including you too, priests. Remember, you are not turning your back on the people. You are inviting them into prayer, and helping them direct their prayers towards Christ dwelling in the Tabernacle), then you do not completely believe in anything you say you do. You are all words but no action. You preach yet nothing perfectly good will come of it until you are all orientated towards Christ." But what about Vatican II??? Every time I get this argument, I literally go through a perfectly methodical format explaining how Vatican II had nothing to do with celebrating mass versus populum. It's only when I have people who are militantly against ad orientem because they are under some delusion that "whatever the priest or bishop says is liquid gold/the priest's been to seminary/it's in Vatican II" with all the different variations that makes this conversation much harder. Let me point out one thing. Bishops, priests, and deacons are human too. They are not infallible. They can teach error. Many do all over the country, but that's a whole other topic for a whole other different blog. I have just posted for you the link to the literal English translation of the Second Vatican Documents on the Sacred Liturgy from the Vatican website. If you wish, you can go onto the website and read the original Latin and then translate it over to English as a fun exercise if you're into that sort of thing. 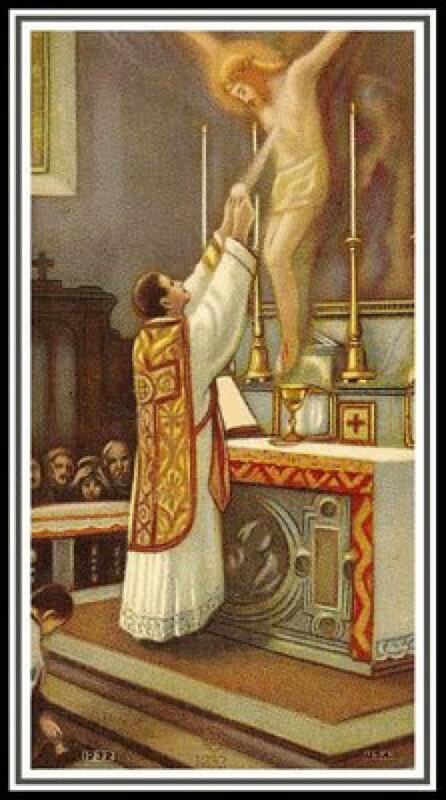 I will personally close my blog and never speak of this subject again if you can find the phrase that talks about having a free standing altar and mass versus populum. If it somehow magically did (which I know it doesn't), I would militantly fight it. However, I know it doesn't I also know by reading books such as "Spirit of the Liturgy" by Benedict XVI that is was not in the Council Father's mind set to ever have versus populum. Even in the Mass of Paul VI there are instructions for when the priest is to turn and face the people such as when he is giving a blessing. 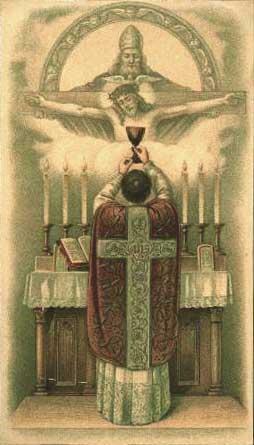 Other than that, he is to face Christ in the Most Blessed Sacrament who is dwelling in the Tabernacle. Look it up yourself. Now, this is where some people feel as if they've won. They may not be able to argue against any of the previous arguments, but by George they'll quote Chapter V, Section II, Article 299 of the GIRM so fast that they'll think they've won the "battle". They'll be so happy so fast you could have sworn it was their birthday. It has nothing to do with true, authentic Catholic interpretation of the reality of the Holy Mass, Our Lord in the Most Blessed Sacrament, or anything other conformity with the sacred tradition of Holy Mother Church. Nope. It has everything to do with the hidden agenda of the "Liturgical Movement" founded in Germany during the Second World War and their own desire to Protestantize the Church and Her sacred liturgy! If you don't know what I'm talking about, look it up sometime. That's why "The New Liturgical Movement" blog called themselves exactly that! They wish to counter act the "Liturgical Movement" that sprung from Germany and ruined the rest of Western Civilization and their celebration of the sacred liturgy during the 1970's. More on this "heretical" group later (I believe them to be heretical. Members of this group have individually be proclaimed heretical, however, the group itself was not ever found heretical). To note, Pope Pius XII encyclical Mediator Dei was in direct reaction to this group's influence within Europe during the 1940's. Also to note about this section of the GIRM - the GIRM, published in 2003, had to be approved by the Congregation for Divine Worship and the Sacraments who's Prefect at that time was Cardinal Arinze (now retired since 2008). Many of the liturgical abuses that were alive and well within the United States during the 1970's and 80's (ex. communion in the hand, no altar rails, etc.) had to be later approved after practically a generation or so of Catholics were already indoctrinated with this mentality. The concession of the Congregation to allow such things is under the category of an "indult", which is an allowance for something to happen. The very elusive language of the GIRM and allowance for the individual Conference of Bishops to essentially be allowed to do whatever they please is in direct contrast to the Second Vatican Council and the prior 1950 years of church tradition and conformity to the Magesterium. I personally view the USCCB to be the hugest waste of time. When you get that many men in own room who hold great amounts of power and are all privately disagreeing with one another, it can never turn into a good idea. To end this section, I am placing a link to a Rome newspaper which states that the Congregation of Divine Worship and the Sacraments is currently in the process of making a manual for priests on how to properly celebrate the Mass which will include the liturgical heresy of versus populum and how that was not in accordance with the Council Father's wishes during the Second Vatican Council. It's taken the Congregation forever and with much resistance from the world's bishops, but they are finally taking stance on what is right! Ad orientem is the only liturgical orientation that perfectly brings about the fullness and authenticity of our Catholic faith. It brings about the re-orientation from worship of man and self back to true worship of Almighty God in such a powerful way that only the Holy Mass can confer. It makes all of us, including the priest, gaze upon the sacred sacrifice on Mount Calvary. It brings about a perfect direction of prayer, for our prayers are then joined with the priest who is celebrating Mass and all facing towards Almighty God, Our Lord and Savior, Jesus Christ, in the Most Blessed Sacrament of the Altar, veiled in the Holy of Holies, in the Tabernacle. I guarantee that by re-configuring all chapels, parishes, cathedrals, etc., to where total worship and prayer was directed towards Almighty God in the Most Blessed Sacrament in the Tabernacle, there would be so many vocations that the world would be transformed to Christ in a matter of months! You wouldn't be able to build seminaries and convents faster! Churches would become so jammed pack with people wanting to witness that which is so sacred! You would have enough priests to bring about the New Evangelization of the world to the Sacred Heart of Jesus! SO MUCH grace can be brought into this world through Our Lord and Savior, Jesus Christ, by just re-orientating our lives and our worship to His truly beautiful and Divine Self within the Holy of Holies, the Tabernacle.